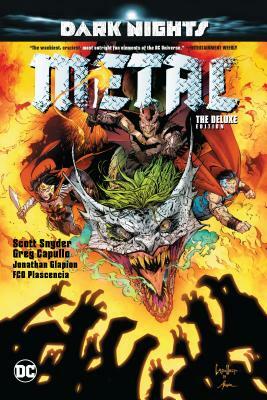 Scott Snyder is a #1 New York Times best-selling writer and one of the most critically acclaimed scribes in all of comics. His works include Batman, All-Star Batman, Batman: Eternal, Superman Unchained, American Vampire, and Swamp Thing. He has also been published in Zoetrope, Tin House, One Story, Epoch, Small Spiral Notebook, and other journals, and has a short story collection, Voodoo Heart, which was published by Dial Press. He teaches at Columbia University and Sarah Lawrence University and lives in New York with his wife, Jeanie, and his son, Jack Presley. Greg Capullo is a self-taught Illustrator and the current artist on the best-selling and highly acclaimed Batman series for DC Comics. Prior to that, he was best known for his 80 issue run on Image Comics' Spawn, created by Todd McFarlane. Other popular comics work includes Marvel Comics’ X-Force and Quasar (as well as a slew of one-shot titles). He is also the creator of The Creech, a Sci-Fi/Horror comic published by Image Comics. Greg has provided art for Blizzard Entertainment’s World of Warcraft, contributed lead character designs for the award-winning HBO animated Spawn series, was the cover artist for many popular musical groups including Korn and Disturbed, and worked behind the scenes on many projects ranging from toy design to video games for TME.